Understanding stress forces is one of the productive steps in changing our experiences regardless of the nature of that experience. The ability to recognize stress forces in any experience helps our success in redirecting, neutralizing or benefiting from them. Despite the common use of stress, that should be called distress, stress forces are not inherently negative. They are part life. Below are three examples of effects of stress we may not connect to stress forces. Enzymes, an essential part of our nutrition are reportedly deactivated at 48° C/118° F. Another term for this deactivation is denatured. Denaturation is a response to external stress. Basal metabolism that impacts how many calories we burn while resting changes by our muscle mass. The increase in muscle mass is a direct response to progressive resistance training stress. Improving brain plasticity that counteracts mental degeneration is connected to brain stimulation that are sufficiently challenging. Challenge is another way of referring to stress. 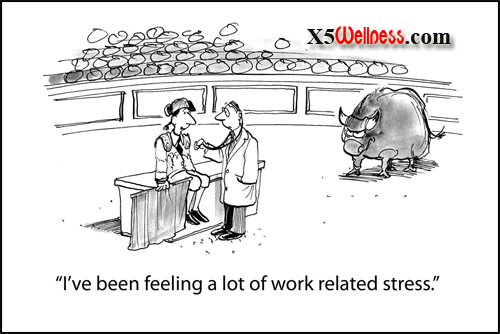 Stress definition itself influences how we are dealing with stress, view it, use it and react to it. In the example of enzymes, heat stress creates a conflict between the organized state of molecular bonds and the broken state of the same molecules. We may not want to break down the molecular bond in an enzymes and deactivate them. However, we do want to break down the molecular bonds in bacterial cells contaminating a water supply. Emotionally, personal dissatisfaction between how we are and how we wish to be is a source of stress. How we wish to be for an alcoholic is getting drunk. How we want to be for an athlete is to workout. Both, the alcoholic, and the athlete feel stress forces. Both are distressed when they cannot reach another state of being different from the one they experience. On the side note, I have known alcoholics with much higher moral values than some athletes I have known. I have also been privileged to know some athletes who exhibited much more compassion and love than some clergy. Labels do not define reality; they often obscure it. The desire for a different type of experience and the dissatisfaction with a current state of being are two forces that influence our actions. Only when the need or discontent creates tensions greater than what we can accept or tolerate we do something. That something we do is often a reaction to help us relieve the tension and not necessarily to change our state of being or access a different one. As soon as the tension we feel reaches tolerable or acceptable levels the need to do anything no longer exists, and our reactionary steps stop. Most of the steps we take in life are reactions to current or past events. True actions belong to a state of being not subject to mental communication through words. When there is a need, there is reaction even if the need is a desire not to have needs. Regardless of the action-oriented or reactionary nature of what we do, when the tension continues or when we take repetitive steps, the process of adaptation begins. With adaptation comes change. Adaption is a response to stress over time. By changing the duration or the tempo of stress, we can change the type of adaptation. Notice that none of the steps I mentioned even remotely connects to the concepts of positive or negative, they are not limited by gender, age or beliefs and they are no constrained by the nature of our desires or dissatisfaction. So far, I have only seen one exception to the process I described and that is a form of Divine Intervention that could alter anything mind can conceive. I have been humbled so many times in life with the loving, unexpected and completely miraculous nature of the Divine Intervention that the only thing I can mention about it is that it exists. How it works and when it works is far beyond my capabilities to even imagine. I like practical things. I have very little interest in spiritual and esoteric knowledge without practical use my daily life. So, I stick to what I can use. Below is an example of how we can change the speed of an exercise to influence the process of adaptation in a leg workout. Controlling the tempo that is a form of dealing with stress forces could help increase muscle mass, strengthen tendons and reduce chances of injury.